Cashmere is one of the finest and most luxurious natural fibres in the world. This means that garments made purely from this material are always impeccable, no matter how much time passes by. However, you need to look after them in the right way, as they call for simple but delicate care. Keep the following guidelines in mind and your clothes will always be perfect, soft, fluffy and impeccable-looking. When you wear your cashmere clothes, try to keep them away from rough-edged items, bags, jewellery, etc. If these items rub against the garment, pilling may occur or – worse still – a tear or a hole may even appear. Try not to put perfume directly onto your cashmere jumper, as it could leave a stain and attract moths. Pilling, or the appearance of bobbles, is one of the most worrying issues when it comes to cashmere, as it stops our garment from looking as good as it should. However, we have to accept that it’s normal for cashmere garments to suffer from pilling. After all, cashmere is the natural hair of a type of goat and some fibers may come loose in the event of friction with other items. It’s perfectly normal and also happens to cashmere of the very highest quality. Bel cashmere pieces are made with world´s best cashmere and they can pill a little. However, good cashmere will only pill at the beginning. Don’t worry, though, solutions do exist! Of course, the less friction with the garment, the fewer the bobbles. But the item is obviously designed to be worn, so if you notice any pilling, there are several ways to remove it. The most recommended is with a hand-held anti-pilling machine, which makes bobbles disappear in a minute. If you don’t have one, you can carefully pass a razor over the garment, as if you were shaving it. But do so very gently and on a hard surface, without pressing down too much to avoid damaging the garment. You’ll see that once the bobbles have been removed, the garment is perfectly impeccable again. Despite what many people think, cashmere garments do not deteriorate with washing. It’s good to wash them. As with fur, after washing they come out softer and fluffier. However, it is also true that you don’t need to wash them after each wear. You can often just hang them out and air them a little. The way to wash cashmere garments will depend on whether the garment is knitted or woven. For woven garments, such as coats or scarves, the most recommended way is dry cleaning. Dry cleaning isn’t recommended for knitwear, unless special treatment is required to remove stains. Wash the garments with a mild, natural or specific detergent for wool or cashmere. We recommend washing the garment before use, as this will remove shorter-length fibres and reduce the appearance of surface bobbles. Don’t hang out a wet cashmere garment, as this will stretch it out of shape. Always wash cashmere in cold water. NEVER use hot water, as it will shrink and become matted. You can wash your knitwear in a washing machine or by hand. Hand washing is gentler, but modern washing machines have great wool programs that will leave the garment perfect. If you have one, put the garment in a mesh bag to prevent it from getting caught up in the washing machine. Don’t use too much detergent. You can also add a little splash of ammonia, which is a great cleaning agent and leaves the garment looking phenomenal. Mix together the water and detergent before putting your cashmere garment into it, so that the detergent is evenly spread. Dunk the garment in soapy water and gently squeeze, but do not wring or rub! Empty the sink or bowl and rinse the garment in water that is at the same temperature. A sudden change in temperature can make your garment shrink. After rinsing, gently press the garment until all the water has drained away. Do not wring. Keep the garment in a ball and gently press with your hands. Spread your wet jumper out on a towel and roll it up. Remove excess water with the towel. 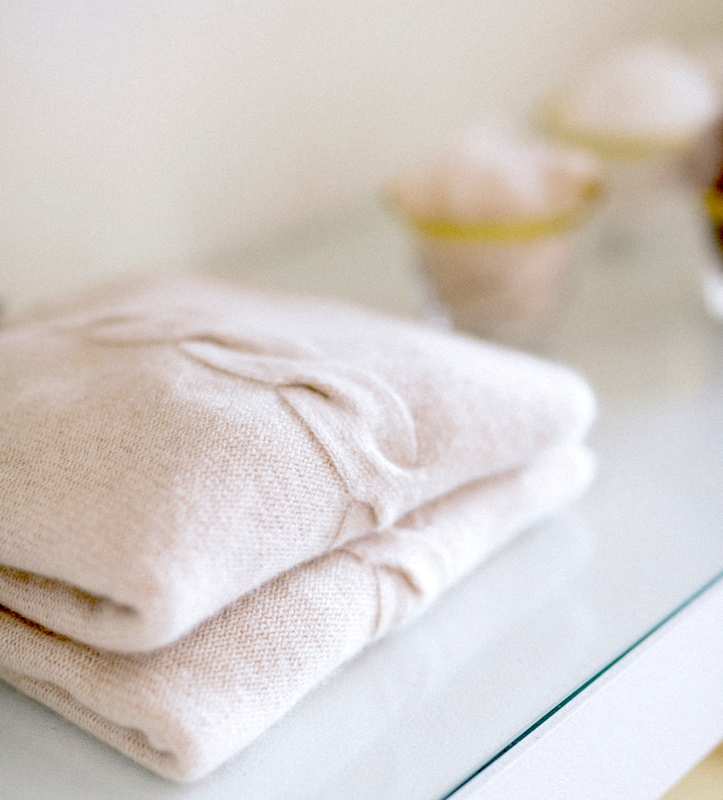 Remove the jumper and place it on a clean towel or clothes rack, making sure to keep its original shape. After washing, always dry the garment stretched out on a flat surface. Never hang it up. You can iron cashmere garments inside out at a low temperature or under a tea towel to prevent shiny marks from the iron. If you’re going to store your thicker jumpers during the summer, make sure you wash them first. Moths are attracted to natural fibres, especially when they are dirty. It’s better to store cashmere garments in cloth bags than in plastic ones, as they perspire better and keep insects away. Do not hang up jumpers! Keep them folded! Keep in mind that you need to take good care of your cashmere garments if you want them to look impecable and you must make sure that you are buying good quality cashmere. As in our case, we make all our cashmere pieces with best quality cashmere from Mongolia. You can have a look at our selection here.